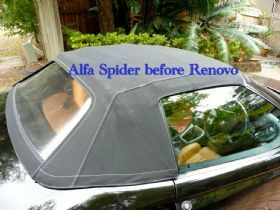 Regular use of Renovo products can prolong the life of convertible canvas and vinyl soft-tops and maintain that as new appearance for many years. If its not too late, Renovo can also resurrect neglected hoods. 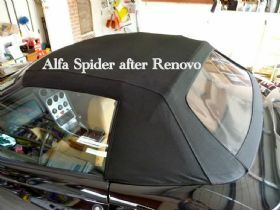 The Renovo product range was developed in the UK some 10 years ago to meet the needs of soft-top convertible car owners who wanted specialty products to clean, restore and protect their valuable hoods and tonneau covers. To ensure that the high quality standard of its brand is not compromised, Renovo has continued to manufacture and package its products in the UK rather than taking a risk on cheaper off-shore options. Canvas Cleaner to remove dirt and grime prior to application of other products or just used by itself to freshen up. TIP: Canvas will absorb contaminants that are not visible to the naked eye and these can effect the absorption of Renovo Reviver and Renovo Ultra Proofer. Canvas Reviver unique to Renovo, available in black and dark blue to re-colour canvas tops. TIP: Reviver cannot be used by itself. It must be sealed with Ultra Proofer. Canvas Ultra Proofer reduces colour fading and restores weather proofing and UV protection. TIP: Pour a small amount of water on a flat section of your top. It should bead immediately (form into small droplets) - if not you have little or no proofer left. Plastic Polish - for treating clouding and dis-colouring on plastic windows, Perspex screens, lights, crash helmet visors, aircraft canopies, boat portholes, etc. Excellent for the auto detailing of all types of convertible tops and tonneau covers our convertibles car cleaner is used worldwide for new car care and classic car detailing. Visit our Reviews and Testimonials pages and see how other people like you have rated our products for their cabriolets care. Just used your RENOVO Canvas Cleaner, Reviver and Ultra Proofer over Easter 2013 on my 2006 Mazda MX-5 NC after someone from the Mazda MX-5 Australia club recommended a try. And I was BLOWN away!! Totally like a new soft top. The fading and white patches which was on the soft top magically disappeared after treatment. Just wanting to let you know, that after receiving your products last week and using them, my Saab roof does not leak anymore! I was amazed at how easy it was to fix the problem of having a shower in my car every time it rained! It is fantastic, and believe me, with all the rain weve had in Melbourne this week, it has well and truly been tested! Thank you so much for providing a fantastic product and all your help. I will certainly be buying the products again and definitely recommending them to others! I seldom have my soft top up. On the rare occasions that I do I notice (especially with the sun behind me) that I could hardly see out of the rear window because of the cloudiness. I found a product on lineRenovo Window Polish...I used it today. The manufacturer recommends two or three applications. I have done just one application so far and I cannot believe the difference. My window is clear. No, I have no connection with Renovo. ha ha ha . I thought others with the same problem would like the information. Renovos Plastic Window Polish is beginning to establish itself as an aviation product for cleaning and polishing perspex canopies and windshields. The light aeroplane windshield quickly loses the clarity it had when new once its been dusted,washed down and flown through variable air conditions. Microscopic scratches eventually make it a challenge to land into a setting sun. Renovo Plastic Polish can fix that. 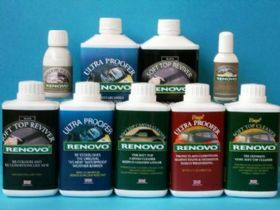 Renovo also makes a cleaner which removes bird-droppings, salt, leaf gum and general gunge from an aircraft cover without harming its water proofing; an ultra proofer which reproofs the cover, contains an ultra-violet inhibitor and resists mould and mildew; and a colour Reviver to smarten up the appearance of your parked machine.